One can safely say Orange County resident Jackie Webb is an avid animal lover. About a decade ago, Webb started donating food and money to the Orange County Animal Services (OCAS) shelter. When OCAS began its Heartworm Treatment Sponsorship Program in 2016, Webb saw it as a perfect opportunity to expand her contributions. 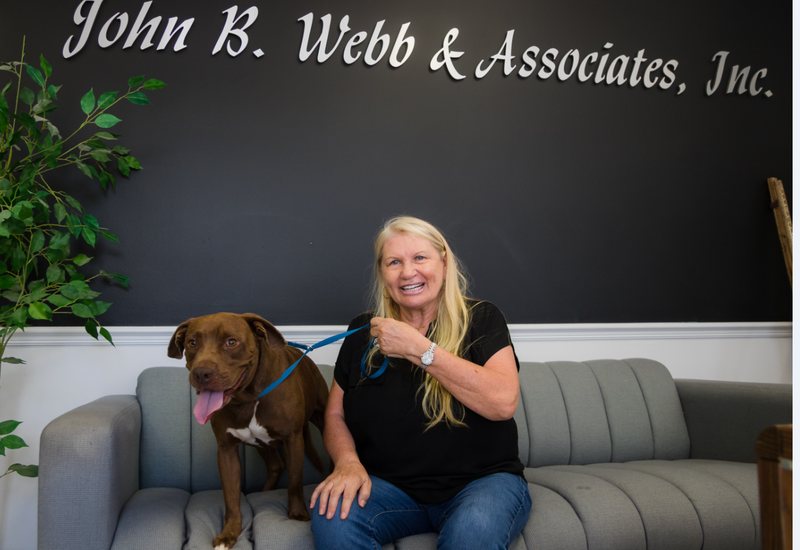 Through her company John B. Webb & Associates, she has paid $19,600 to sponsor 97 dogs for heartworm treatment so far in 2018, with another $14,350 pledged in the future. In 2017, she also sponsored 36 dogs with a total donation of $12,600. Webb’s generous donation equates to a total of 133 dogs sponsored and a lifetime giving of $46,550 so far. Born in Scotland, Webb began volunteering at Glasgow’s Cardonald Cat and Dog Home as a young child. At the age of 12, she won the prestigious Duke of Edinburgh’s Award for her charity work. When Webb moved to Winter Park 27 years ago, she got involved with Orange County Animal Services, the only open-admission shelter in Orange County. OCAS has identified heartworm disease as a deterrent to adoption and created the program to offer local businesses the opportunity to sponsor treatment for heartworm-afflicted dogs. Heartworm is a parasitic roundworm that spreads from host to host through the bites of mosquitoes. When a dog is bitten by an infected mosquito, the transmitted larvae mature into adult heartworms. They then begin reproducing in the heart, lungs and surrounding blood vessels. It can be fatal if left untreated, though it is a curable disease once contracted. It is also highly preventable. Local businesses have stepped up to sponsor shelter dogs. Sponsors pledge $350 per dog, which is the cost of heartworm treatment. Many businesses generously choose to sponsor one animal per month. Other businesses have become regular heartworm sponsors including Power Design, Wean & Malchow, P.A. and Franchina Law. Like many other OCAS partners, Webb is committed to helping as many dogs as she can. The heartworm program as a whole has sponsored a total of 419 dogs and counting, since its conception in November 2016. There are approximately 20 sponsors who contribute to the program. If you are interested in becoming a heartworm sponsor, email HeartwormProgram@ocfl.net or visit http://ocnetpets.com/GetInvolved/HeartwormSponsorships.aspx. All heartworm sponsorships are $350 and may be applied to specific dogs, if desired. Sponsor a dog with heartworm disease and save a life. People cannot get heartworms from their dogs. It is a specific parasite that affects only dogs and, occasionally, cats. Dogs cannot transmit heartworms to each other. Only a bite from an infected mosquito can transmit the disease. Heartworm disease can be avoided by treating your dog with heartworm preventatives either topically, by pill or via injections. A dog can get heartworm disease even after he or she has been successfully treated and cured. That is why prevention is so crucial. Photo Caption: Jackie Webb supports Orange County Animal Services by helping dogs with heartworm. She is pictured with one of her furry friends named Duke, who is available for adoption at Orange County Animal Services.